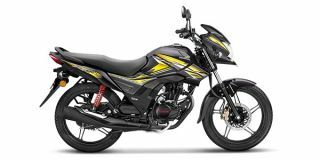 A more premium alternative to the Honda Shine, this 125cc motorcycle gets a sharper, sportier bodywork. Other premium bits include a digital-analogue instrument cluster, split 5-spoke alloys and blacked out parts. Mechanically, the CB Shine SP gets a 5-speed gearbox and low-rolling-resistance tyres from MRF. For braking, the bike gets 130mm drums a ll around with Honda's Combi Brake System (CBS) as standard. The disc brake variant gets a 240mm front disc.